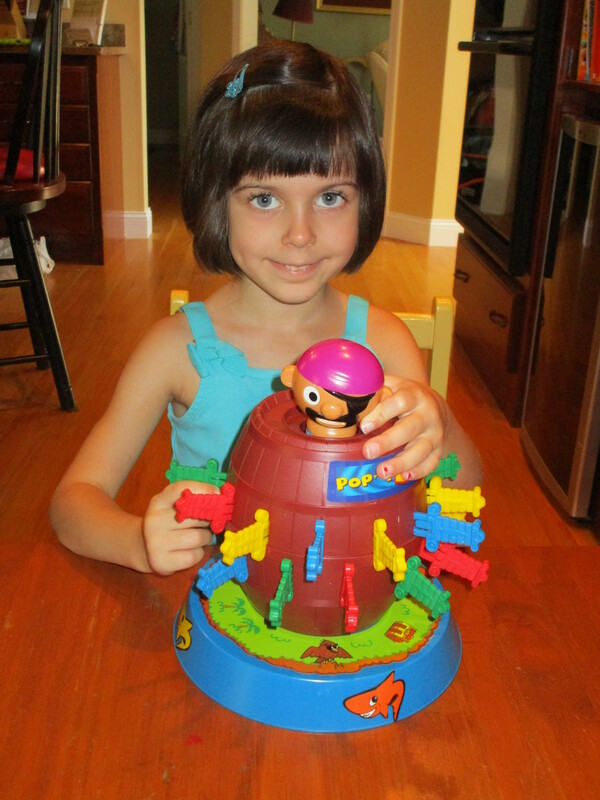 A while back, I was playing Pop-Up Pirate with Jocelyn, who was four at the time. In the game, you take turns pushing swords into a plastic barrel where a pirate is hiding. Each time, a different slot accesses a spring activated coil that shoots the pirate up into the air when you push a sword in. It’s like a Jack-In-The-Box: you know the pirate is going to pop up at some point, but it’s nerve wracking not knowing when, then utterly startling when it does. The one who pops up the pirate loses the game. Although Jocelyn screamed every time the pirate popped up, she loved the thrill of the unexpected. She thought that was the funnest part, and decided to change the rules: the one who popped up the pirate now became the winner. I loved her perspective. I loved that she could embrace the discomfort of not knowing when the pirate would pop up, and then see losing as winning. I am a control freak who does not like anything to “pop up.” I want things to go according to my agenda. I plan everything, and most things I plan weeks or months in advance. But summer weather in New England is like Pop-Up Pirate. You never know when those storm clouds are going to appear. Tuesday was a perfect example. We have lived in our town for over eight years, and I have never been to this establishment. It was like stepping into the 1950’s. They have tables with Formica tops, mismatched chairs, crafty items for sale all over the walls, and kids’ heights measured on the frame of the door. I loved it. The hour we spent there is now one of my favorite memories from this summer! The four of us talked, drew, laughed, reminisced about our summer, and just enjoyed being together. Had we gone to the pool date, we would have had a wonderful time too. But my kids would have swam in the pool, and I would have spent the entire time talking to my cousin, not my children. I would have missed that opportunity to really connect with my kids and make that memory. God knew I didn’t have enough of that this summer with all of the busyness. He saw school was starting next week and that the summer days were running out. So He gave me the gift of unexpected quality time with my kids. That’s what God wants for all of us moms. He wants to see us just be with our kids, taking part in their jokes, laughing with them, making memories. He wants us to relax into His plan for our days. He wants us to roll with the unexpected, because what we see as a loss, is actually God offering us an opportunity to win something else. Although on Tuesday we lost the chance to swim and visit with my cousin, without a doubt, we won in a completely different way.